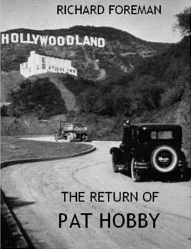 Pat Hobby, the forty-nine year old screenwriter, is back. Richard Foreman brings F. Scott Fitzgerald’s comic creation back to life – his cynicism, alcoholism and bad luck – in four wonderfully funny and melancholy short stories. Foreman, the acclaimed author of the Raffles series of books, injects his trademark dry wit and surprise twists into each story, whilst honouring the spirit of Fitzgerald’s original sketches. The Return of Pat Hobby includes the following stories. Pat Hobby is back. He has a new contract, a new secretary and he is writing a script for one of Hollywood’s biggest stars – the horse, Ajax. Pat duly treats himself to a few drinks to celebrate, but the morning after brings more than just a headache. Pat is a man with a plan. He is going to extract some money out of his ex-wife and her new husband for a film project. How? He is going to pretend to be dying. He has the morals (or lack of) and the plot for the movie. But is he in possession of that most precious of commodities in Hollywood, good luck? Pat Hobby is taking the afternoon off work. It’s too hot to work, he argues. Sleep beckons, as Pat is about to rest his head upon the bar – but the voice of an angel, the would-be actress Grace Turner, arouses him. “The lunatics have taken over the asylum,” Pat remarks. A box office star, Robert Earle, has demanded that he produce the screenplay for his next picture. Pat is sent over to his hotel suite to assist him. Earle is handsome, intelligent and charming. He is everything that Pat is not, but opposites can attract. Richard Foreman is the author of the Raffles: The Gentleman Thief series of books and the historical novel, A Hero of Our Time. He lives in London.